RVC3000 leverages existing investments in TVs, video and audio gear by connecting them to the RVC Codec directly and it can be customized for any meeting room. Plug in single or multiple displays. Add a PTZ or FOR camera with your audio system. RVC3000 helps users to pick the hardware that fits their need as far as the number of displays, HD camera and speakers so users can build their solution with the lowest cost ever. No matter how Lync is deployed at your organization, The RVC System works with on-premises Lync Server 2010 and 2013, Lync Online as part of Oﬃce 365, or hybrid Microsoft Lync environments. RVC3000 gives you HD video, three smart ways of content sharing, high quality audio, Lync familiar UI, and great meeting room features and experience all enclosed in a small square 4"x4" Codec. Native Integration with Microsoft Lync brings the familiar Lync UI in a simple and intuitive RVC user interface without prior training or access to the system. Plug a USB Flash Drive to the RVC Codec and start sharing supported files right away or use the HDMI cable to connect your laptop or you can share content from your laptop, tablet, or smartphone to the RVC system with Wireless Content Sharing. With RVC you’re one click away from holding or joining a meeting because RVC3000 system’s User Interface is designed to work with any touch or regular display. Vytru RVC3000 (now Room 4) system extends Microsoft Lync/Skype for business to the video conference room while reserving the familiar Microsoft Lync features so users can participate in audio and video conference calls with people and systems in your organization's Microsoft Lync directory. 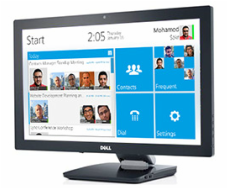 EVC is a video conference system dedicated for desktop users who are always in a need to meet face to face with remote colleagues, partners, and customers, without leaving their desk.